The Asian Lunar New Year (aka Chinese New Year) begins on Friday, January 31, the first day of a 15-day festival marking the start of the Year of the Horse. What a terrific opportunity to view the noisy, colorful parades, celebrate with family and friends, and enjoy mountains of good food. Gong Hay Fat Choy! If you are in Seattle, click here for a schedule of events at Hing Hay Park on Saturday, February 1. It will be a busy day full of Lion and Dragon Dances, Taiko Drumming, Drill Teams, Martial Arts Demonstrations, and a Children's Parade. Or consider a drive across a bridge to celebrate on the other side of Lake Washington and join Bellevue's celebration the following weekend. 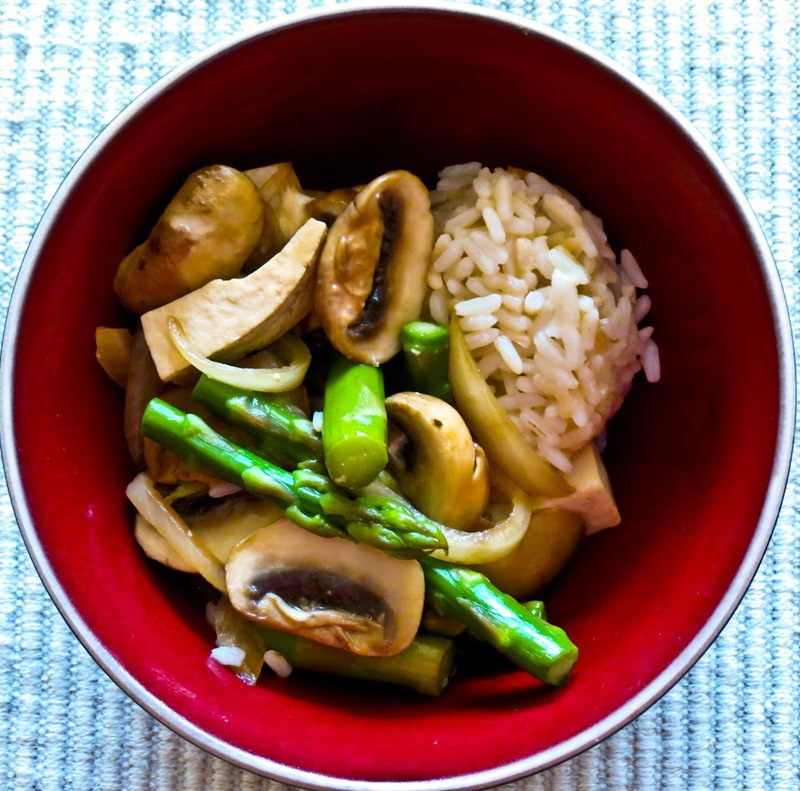 I searched my blog archives for some appropriate dishes and came up with these Asian-flavored favorites, more fusion than Chinese but "in the spirit of". Click on any of the titles below to take you to the recipe. 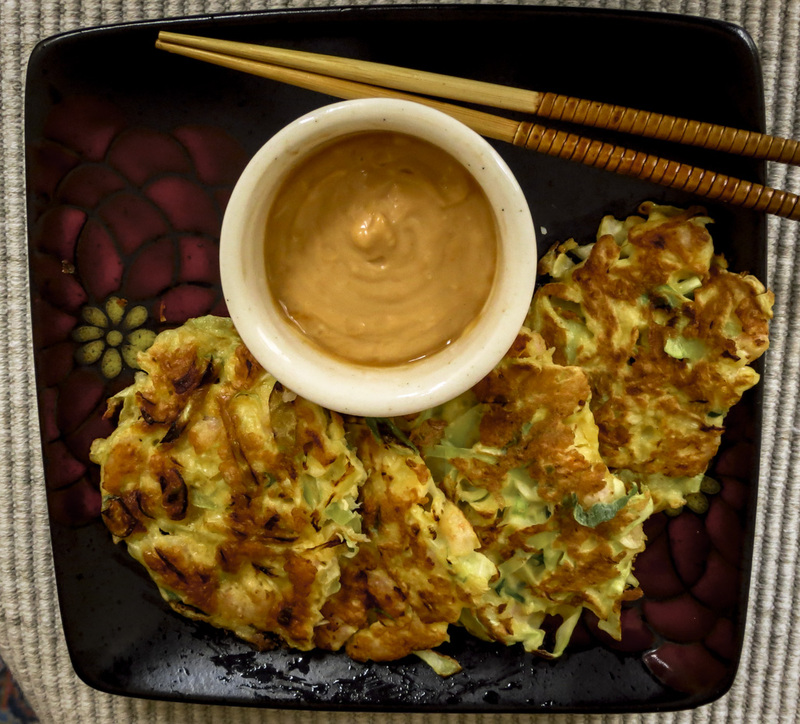 For more inspiration check out Jaden’s post at SmittenKitchen for a roundup of her tasty recipes and links to a gazillion others. Early, really early morning hours are the best time of the day; time without interruption to let my mind wander or focus on writing, an opportunity to read further in a compelling book, or time in the kitchen or galley to play with a new recipe. Lately these hours before dawn have been a time to ease into the day at the computer, randomly skimming my favorite blogs and often clicking through links to find something new. 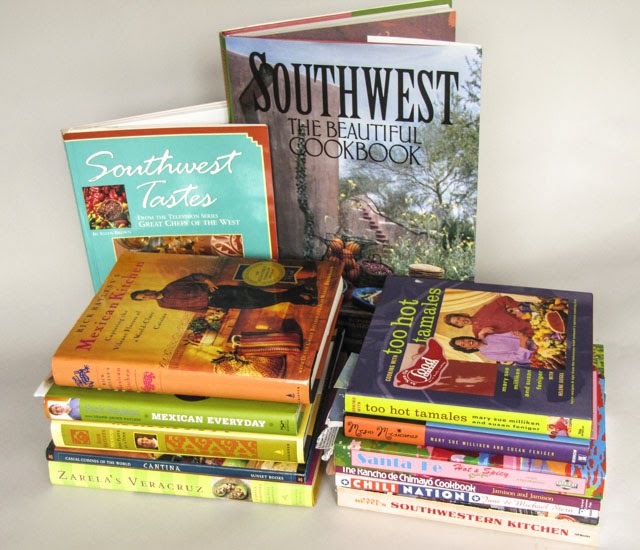 Today I found The Food Blogger Cookbook Swap. I almost missed it, misreading the title, and thought it odd to schedule a cookie swap in January. A second glance cleared up the puzzle, aha! 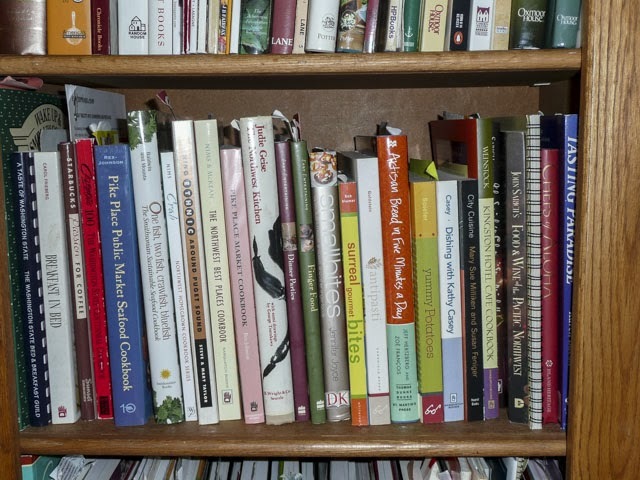 a cookbook swap. 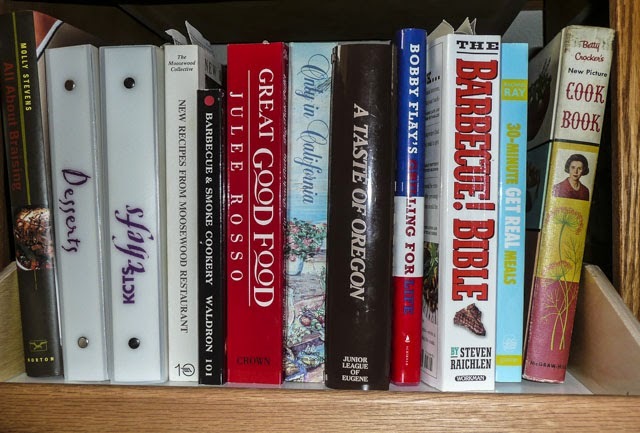 Organized by Alyssa of EverydayMaven and Faith of AnEdibleMosaic, this exchange is open to U.S. food bloggers willing to share a new or gently-used cookbook and write a post about it. What a terrific way to connect with others in the food blogging community. I'm in! Have you signed up yet? Click here to read more about this fun event. January 2014 - Keep it Simple! A pan of delicious dinner rolls accompanied most family dinners at my mother-in-laws table. 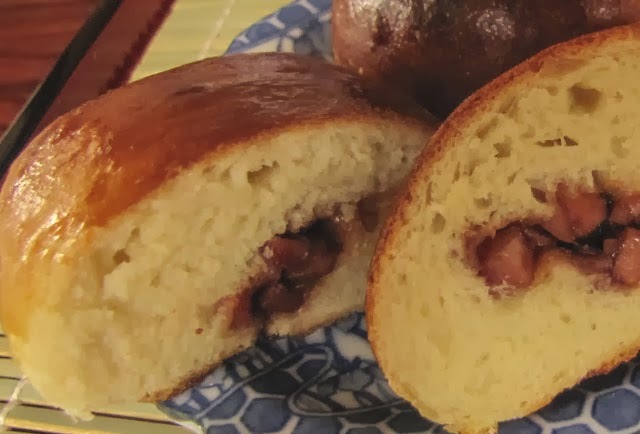 For decades she turned out batch after batch of light, airy rolls effortlessly, quickly, without any cookbook or recipe card in sight, adjusting flour/water ratios by the feel of the dough. 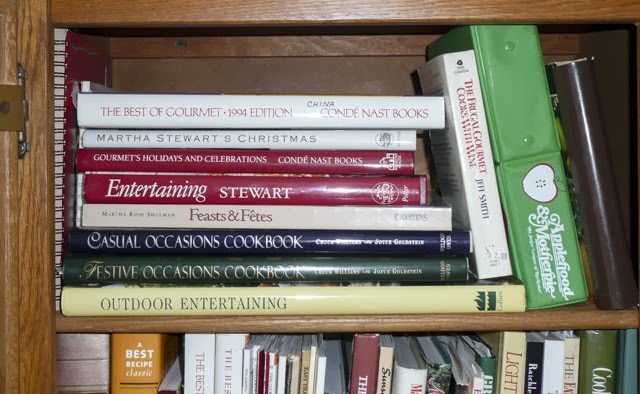 I wish I had spent more time with her in the kitchen, sharing stories and baking together. 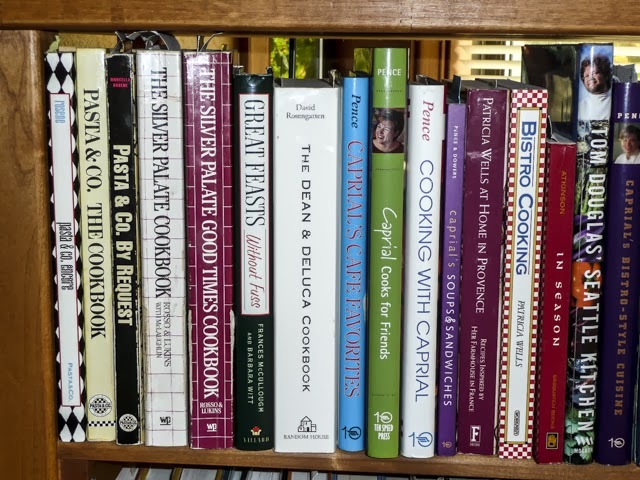 Irene has passed and I regret the missed the opportunities to share many of her recipes. I think she might approve of this pan of Quick Dinner Rolls, not as tender as I remember hers but perfectly adequate. 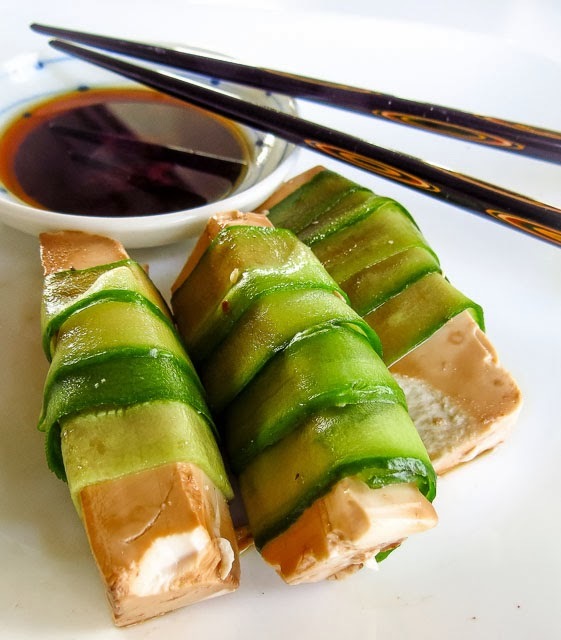 Her rolls were not fancy shapes or full of extra add-ins, but they were heavenly. As is so often the case, simple was best. 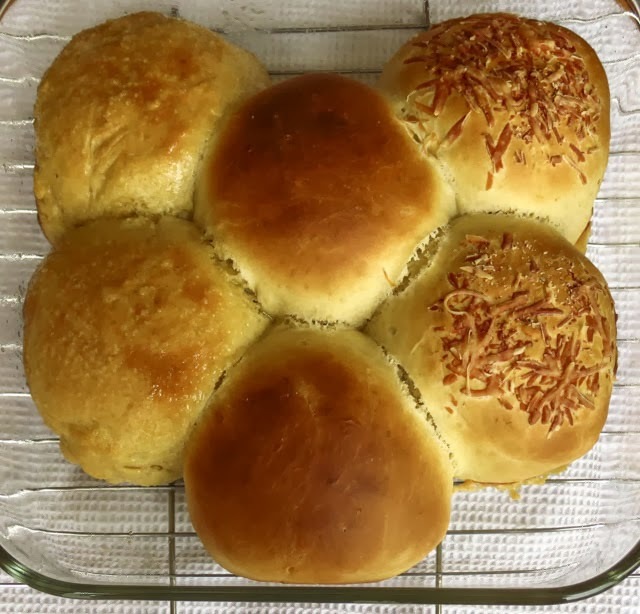 The #TwelveLoaves "Keep it Simple" theme for January's challenge was the perfect invitation to bake a pan of quick dinner rolls. Not that baking ever requires an invitation or even an excuse, but I usually bake loaves rather than rolls. This month I spent waaaay to much time researching online, reading blog posts and skimming various recipes; 30 Minute Rolls, Quick Dinner Rolls, No Knead Rolls, Parker House Rolls, Overnight Refrigerator Rolls... Too many choices! 30 Minute Rolls sounded good and looked simple, so that made the decision easy. 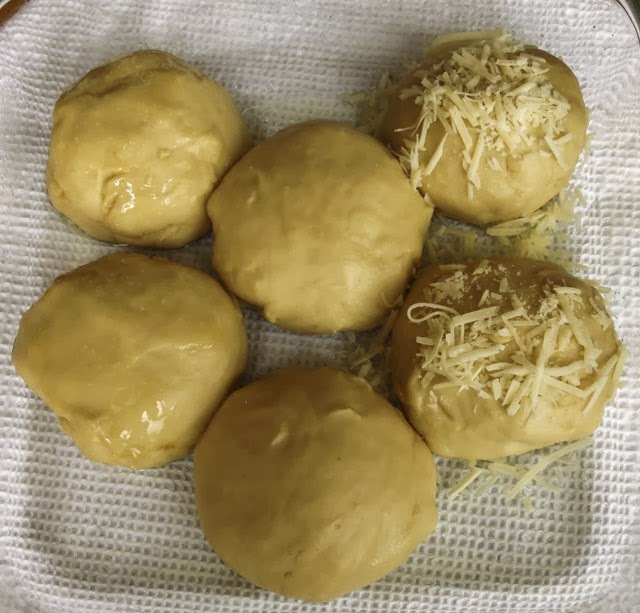 I prepared a half-recipe and experimented with toppings: 2 rolls were brushed with melted garlic butter before and after baking, 2 rolls in the center of the pan were left unadorned, and 2 rolls were sprinkled with a tablespoon of fresh shredded Parmesan cheese. No herbs added into the dough, though I was really tempted. The rolls took longer than 30 minutes but under an hour so, yes, they were quick for yeast rolls. Fresh from the oven the rolls' interiors were soft though not especially light. The next day they were heavy and leaden, not as dry as day-old biscuits but no longer tender. Irene steamed her rolls to reheat them if there were any left over, but I didn't try that with this batch. The flavor? Well, it was just a fresh bread taste similar to that of any warm, white AP loaf. 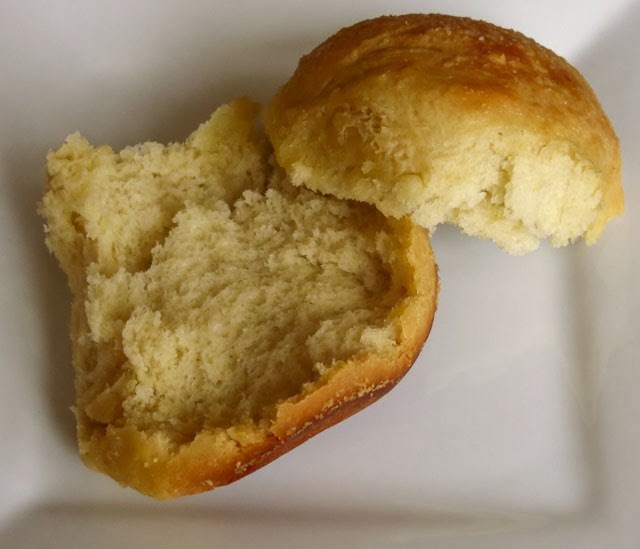 RL reported the rolls reminded him of his mom's rolls, but they weren't quite the same. That's an invitation to try another recipe and keep baking. Add the salt, egg and flour to the mixing bowl. Use the dough hook on a stand mixer and mix until the dough is soft & supple. Add an extra tablespoon or two of flour as needed to bring the dough together, it should be fairly wet and a bit sticky. Form into 12 (or more) medium-sized balls. Place in a greased 9x13 pan and let rest for 10 minutes. 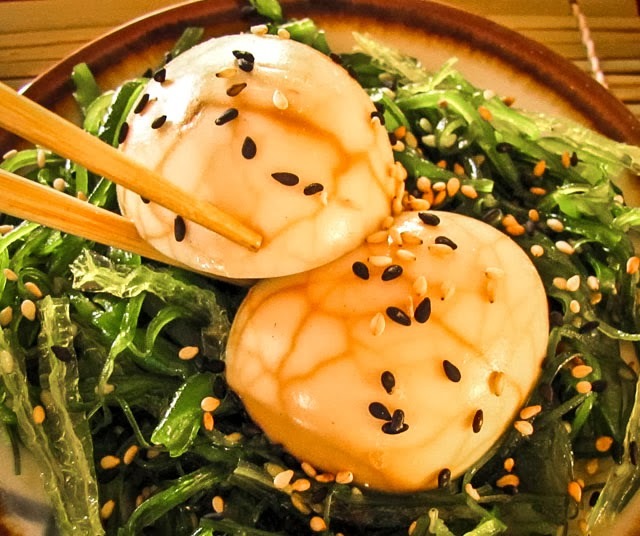 They will begin to rise at room temperature and finish in the oven. Bake 10+ minutes in a preheated 400 F or until the tops are a deep golden brown (more like 20+ minutes in my oven). Remove from oven and brush with each top with melted butter (garlic butter is better!). 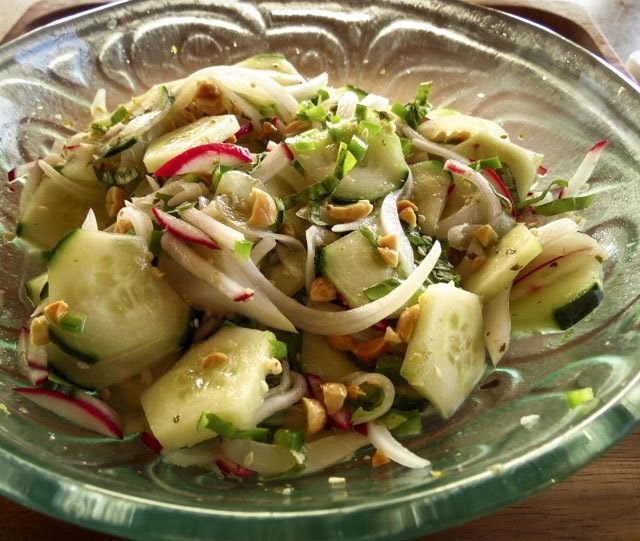 #TwelveLoaves Bakers have created a tempting assortment of simple recipes this month. Click HERE to see the collection. What is your favorite simple bread? Focaccia and I are old friends and share a casual, anything-goes relationship over ingredient add-ins and toppings. Minty Focaccia with Lemon and Pine Nuts remains my favorite to date, but topping choices do tend to vary from one batch to the next. 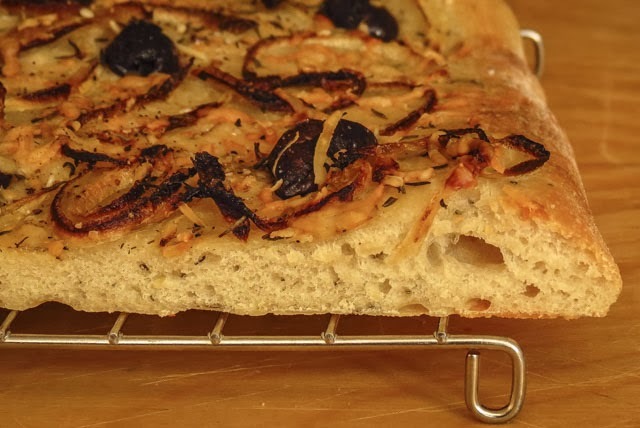 When SourdoughSurprises selected focaccia as this month's feature, I thought "Easy peasy, been there, done that." Hah! 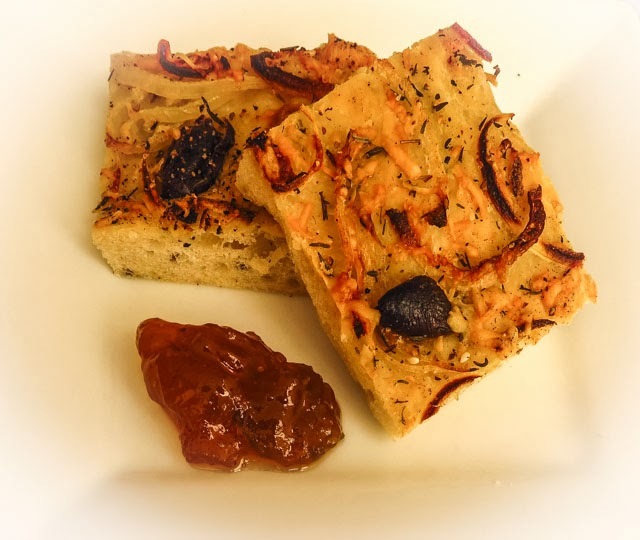 what a surprise to find I had no 100% sourdough focaccia recipes in my files. Zero... zippo... nada... none! Why not? because I usually add sourdough starter to the commercial yeast called for in conventional bread or pizza recipes for a faster, no-need-to-plan-days-ahead process. Okay, this was the perfect opportunity to dive right in and let the sourdough starter perform its magic. 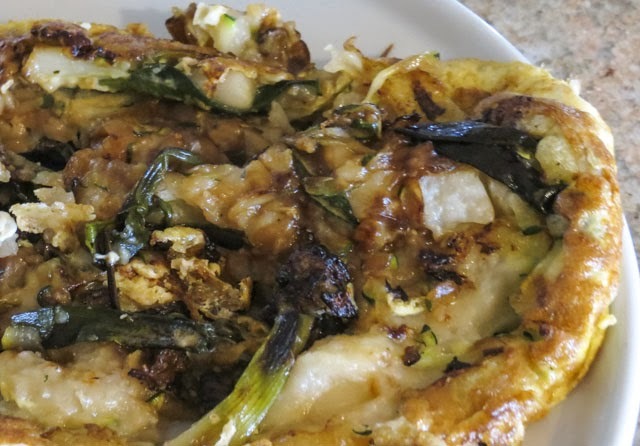 A stroke of luck and A Google search led me to Sara's blog, Heartland Renaissance, and the recipe I worked with this month. 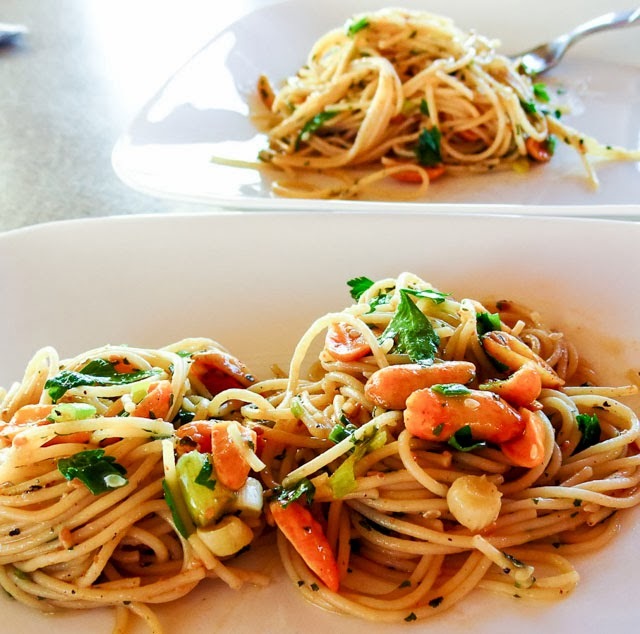 Visit her site to check out the recipe and the directions. 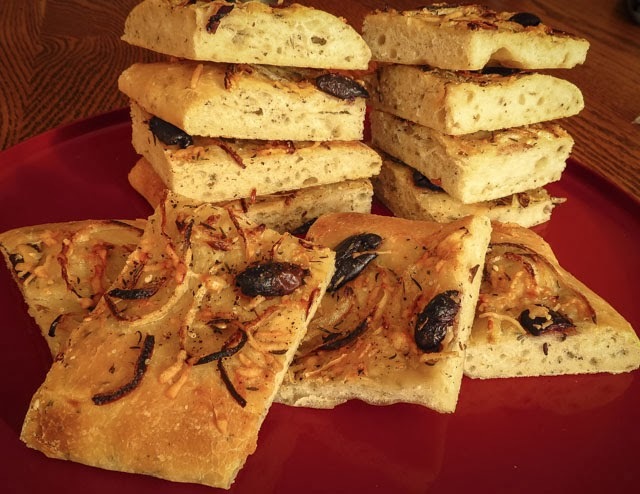 The two focaccia stories Sara includes in her post are worth reading even if you don't want the recipe. My starter was refreshed and ready to work but I wasn't, I procrastinated until late evening. So much for planning ahead! That extra time encouraged me to play with the recipe a tiny bit, adding a heaping teaspoon of Za'atar to the dough. A 9:30pm start meant either a thru-the-night baking session or inserting a delay in the process. I went for the delay, splitting the first rise into two portions; 1 hour in my 67 F kitchen, followed by a gentle folding of the dough and an 8-hour overnight stay at 40 F on a shelf in the garage. Back inside the warm kitchen the next morning the dough warmed up, was stretched in the pan and sat through it's second rise. 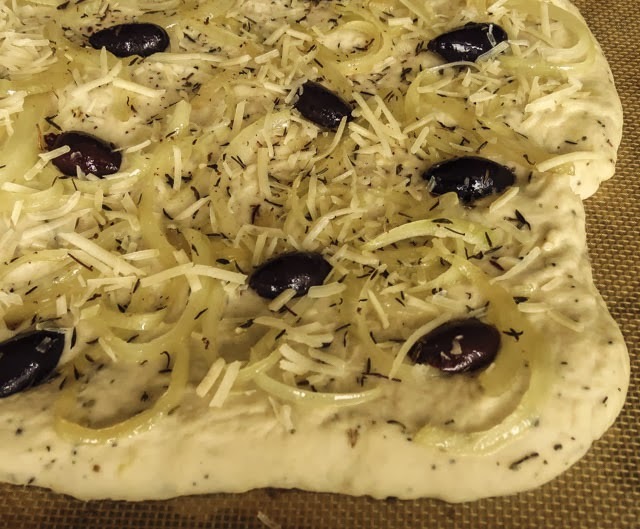 Dimpled and topped with lightly caramelized onions, kalamata olives, shredded fresh Parmesan, more Za'atar and some coarse sea salt, this focaccia was ready to hit the oven. Photo: Focaccia with toppings, ready to bake. The crisp golden brown crust provided a satisfying crunch and the interior of the loaf was soft and chewy, though with a tighter crumb and less oven spring than expected. The loaf rose more than crackers or flatbread, but I had hoped for more loft. Hmmm, did that overnight delay impact the rise? did I forget the honey? was there a flour issue? did I stretch the dough too thin? I'll have to sort all that out next time, when I actually do plan ahead properly. While this focaccia loaf was a bit low-rise its sourdough tang came through beautifully, not too assertively sour but definitely there. RL nibbled on two squares, commented that he had eaten this before and would rather have real sourdough bread. Hmmm, that's an apples and oranges comparison with his favorite loaf. I enthusiastically ate more than two squares, at more than one sitting - just to do a thorough evaluation, you understand. 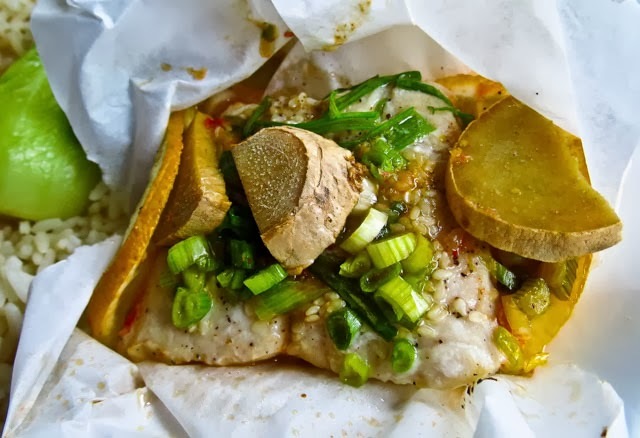 *Plain: the salty, flavorful toppings were so taste-forward the bread was overshadowed. *Split and buttered: not recommended, and this comes from someone who loves butter. *Dipped in olive oil: yes! and next time add some balsamic vinegar to the EVOO. 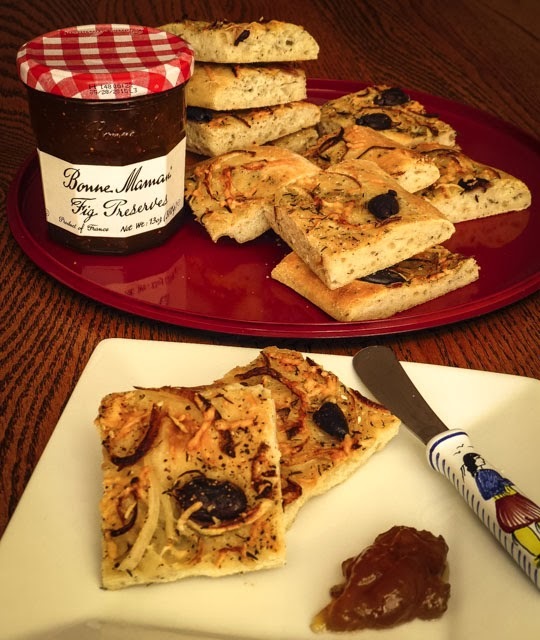 *Split and spread with Fig Preserves: my absolute favorite bite, and I will definitely enjoy this combo again. *Split and used to hold a soppresata & cheese sandwich: delicious, of course! Isn't it amazing what flour, water, olive oil, honey and salt can produce when combined with sourdough yeasties?! 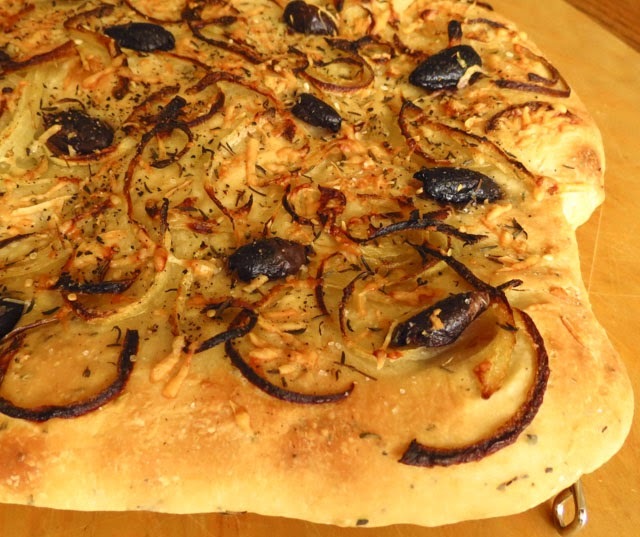 Now I can't wait to enjoy more focaccia recipes from other Sourdough Surprises bakers. ...baked with pasta or rice. The chicken and vegetable combination is terrific even without the creamy sauce, but toss in the Parmesan, lemon zest and nuts to really pop the flavor. I would pair this chicken/vegie blend with a tangy cheese to fill crepes, omelets, panini or even quesadillas... but that's for another day. I promise myself a return to the path of healthier eating tomorrow, but today a Chicken Florentine Casserole provided comfort food therapy. I loved every decadent bite. 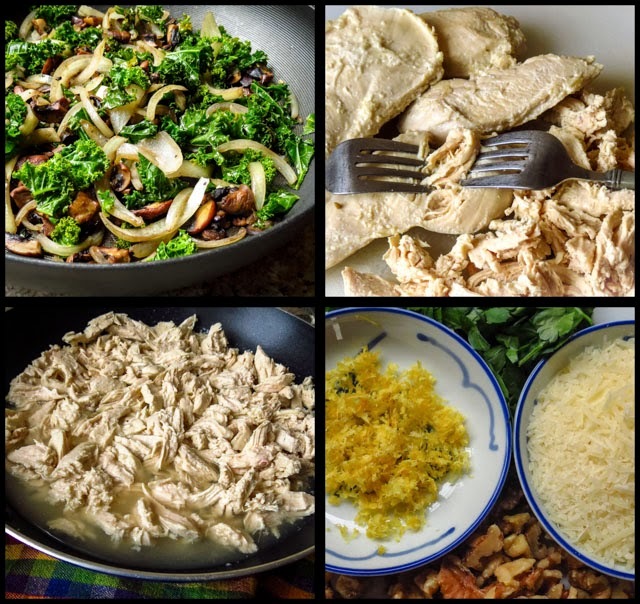 Remove the barely cooked chicken pieces to a platter or cutting board, saving the broth in the skillet. 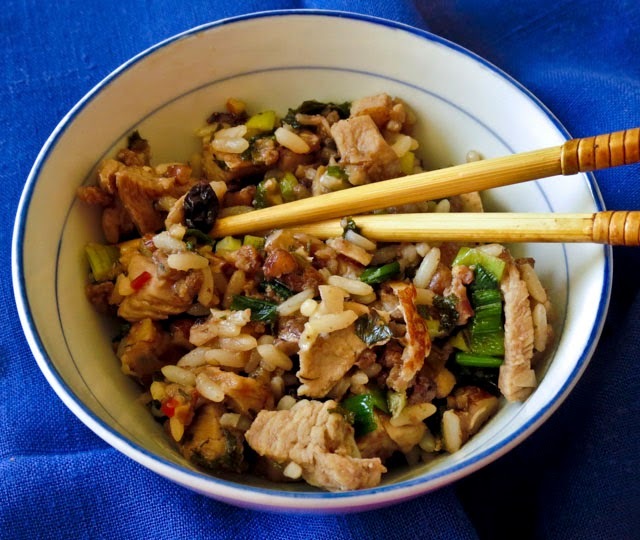 Use 2 forks or your fingers to shred the meat along the grain into bite-size chunks. Return to the now-cooled broth to soak up some liquid and avoid drying out. Add the butter and oil to a second skillet and warm over medium-high heat. Add the ‘shrooms and cook until they begin to give up some of their liquid. Add the onions and garlic and cook until fragrant, 1 to 2 minutes. 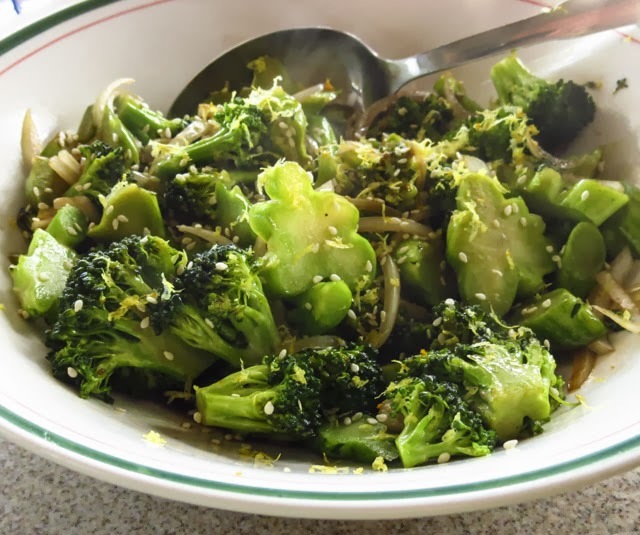 Stir in the thyme and kale, cover the skillet, lower the heat to medium-low and cook another 5 minutes while the vegetables soften and give up more liquid. Uncover and simmer to reduce the liquid, but don't cook the pan dry. 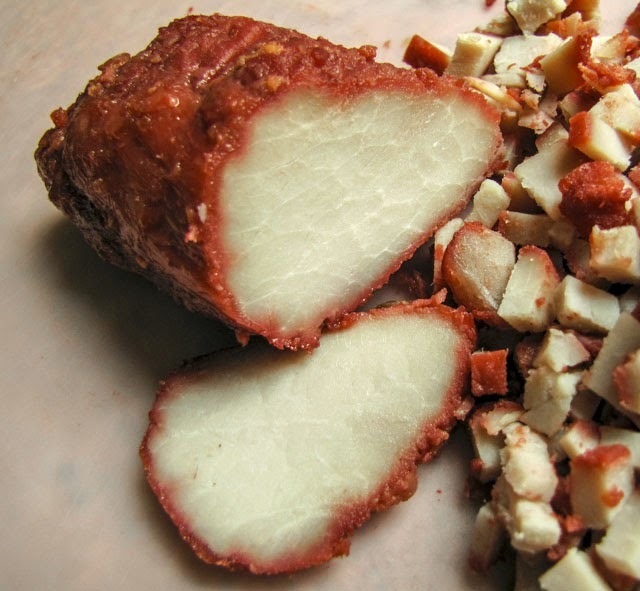 Taste and add salt and white pepper to suit your palate. Remove from the heat and whisk in the sour cream. 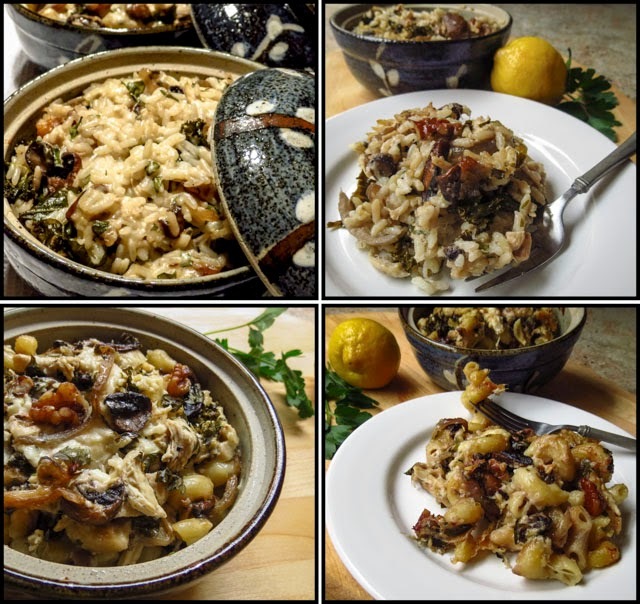 Add the Parmesan, lemon zest, walnuts and parsley and stir to incorporate. Taste and adjust seasonings, adding hot sauce if desired. 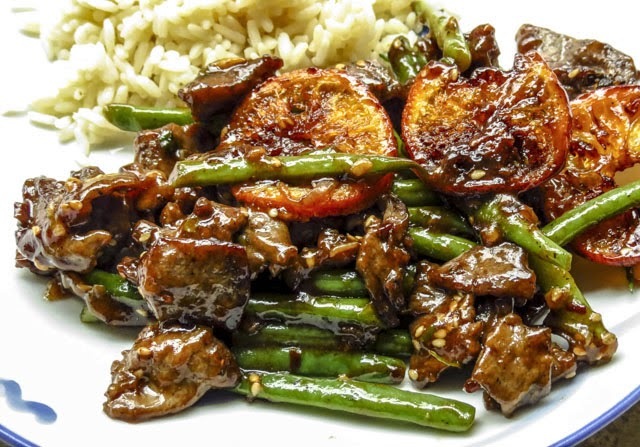 Combine a portion of the chicken with an equal portion of vegetables; add just enough sauce to moisten; fold or toss to incorporate. Add an equal amount of pasta (or a half portion of rice) and additional sauce until well-coated (but not swimming in sauce). Fill individual baking dishes or ramekins, cover and bake for 20 to 30 minutes to heat thoroughly. Serve with extra sauce, your favorite hot sauce and shredded Parmesan on the side.